In honor of Indies First Day (and Small Business Saturday) the Palouse Writers Guild has teamed up with BookPeople of Moscow to bring a fantastic line-up of authors to downtown Moscow. The eight participating local authors have written a combined total of twenty-four books and many of them have other works that have been published in anthologies or projects on which they contributed as an editor. 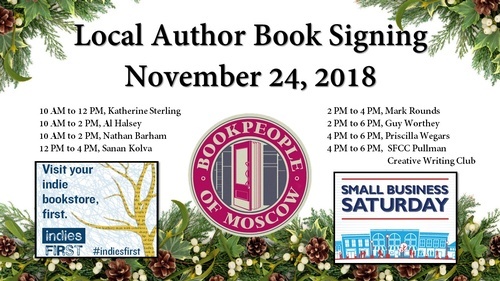 On Saturday, November 24th, all eight authors will be on hand to meet with the public and sign books at BookPeople of Moscow.